ANGELO FICHERA TTN The study lounge on the fourth floor was converted into a dorm room. Students in the lounge were asked by the university to relocate, but a petition helped them to stay for a year. After being told they would have to leave their study-lounge-turned-dorm, students petitioned to stay. Freshman theater major Talia Simon said she booked her room in Johnson Hall back in February, but last week she and her roommates were asked by the Office of Housing and Residential Life to leave the room by Sept. 16, and to relocate to another dorm. Simon and her three roommates, all freshmen, live in what some call an “overbooked lounge,” a dorm room that was once a study lounge, on the fourth floor of Johnson Hall. With students being overbooked into the residence halls, the university allowed for a maximum of four students to live in the lounges. The students living in the lounges were still placed under the same rules and regulations set forth by the residential life office. Simon’s three other roommates, social work major Katie Hoffman, journalism major Samantha Grinnan and art education and fine arts major Hailey Braham said that they were all acquainted with one another before they moved into the overbooked lounge. But on the morning of Sept. 7, Simon said she and her roommates, along with other students living in overbooked lounges in Johnson and Hardwick halls, were emailed by Residential Life, stating that they would have to move out of their rooms. Grinnan said that the email simply stated they must make a “mandatory move out of the rooms,” and find other living quarters. “We were to pick another room by Sunday [Sept. 11] and be moved out by Friday [Sept. 16,]” Grinnan said. 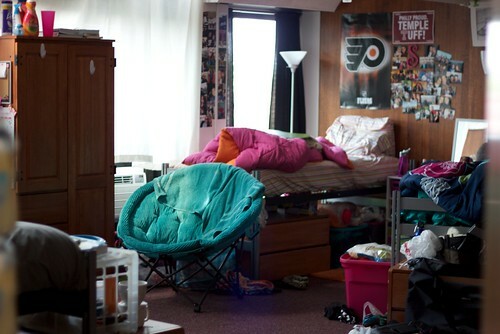 Residential Life Supervisor Laura Randolph explained in an email to The Temple News that, after reviewing the housing license of Johnson and Hardwick halls, her department noticed that not all spaces in the dorm rooms were being filled by students. “We felt that instead of four students sharing a living space, we could provide a two-person living environment similar to the rest of our residential population,” Randolph said. The girls explained that they were “in shock,” and sent emails to their parents, resident assistants and directors regarding the matter. Later in the day on Wednesday, they met with the resident director of Johnson Hall, Megan Connelly, to go over the email. Barham and her roommates said they were given the option to move into other dorm rooms in Johnson, Hardwick or Peabody halls. “I said, ‘We are not moving. Unless there’s a safety issue, we are staying,’” Barham said. Barham explained that the girls made an effort to inform Connelly that they did not want to move out of the lounge and wanted to stay together. The girls, along with several others in similar situations, formed a petition, requesting signatures in support the roommates staying their current living space. Barham said that, within 20 minutes of making the petition, the girls had more than 60 signatures from the other residents on their floor supporting their cause. Freshman communications major Molly Moran said she and her roommates, struggling with the same issue, also petitioned to stay in their room on the fifth floor lounge of Hardwick Hall. “We got our [entire] floor and some people on the floor above us to sign it,” Moran said. Moran said that they met with their residential director, Temple Jordan, as well, and informed her of the petition they put together and that they wished to remain where they were. “[Jordan] didn’t realize everyone would be so upset by it,” Moran said. The students in the lounges have since been told they will be able to stay in the rooms for the rest of the year. “We felt that moving these students would be more harmful to their residential experience and made the decision for them to remain for the remainder of the academic year,” Randolph said. What?! Are you kidding? You finally get a room and you don’t want to leave because you guys are all friends and don’t want to leave each other, get real! It’s not like these girls are never gonna see each other again. Get a grip. Some people don’t even get housing and now you have an actual room and you wanna be a brat about it.